Scintillating review, Rowena. 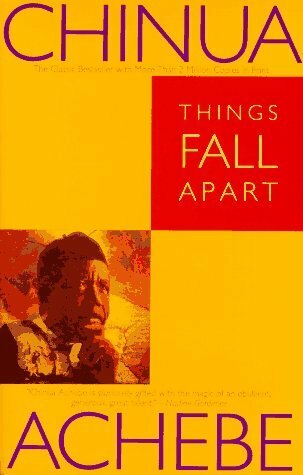 I must try reading this again since I know that Achebe is an accomplished writer. The misogyny had turned me off a while ago. Thanks Samadrita:) The misogyny is something I get angrier at every time I read it. I’m not 100% sure why Achebe made Okonkwo so extreme in his misogyny but I think it might have been a way for him to illustrate the patriarchal aspect of traditional African culture. Yes you are right there. Achebe was just portraying African culture just the way it was in an effort to dispel wrong notions held previously by Europeans. But somehow I find Achebe much more exuberant and expressive in his essays. I can’t wait to read his essays! If I remember correctly you reviewed a collection of his essays. I’ll start with that one I think. Reblogged this on Thoughts Of An Introvert. This was on my reading list last year and I didn’t get to it. I *will* be reading it this year, hopefully soon. Great review. Thanks Heather! I hope you like it. It didn’t take me long to read at all. Great review! Thanks for raising interesting questions about (abandoning) traditions and (adopting) new or even foreign ways. I’m suggesting this book to my African Book Club! This is a brilliant review of such an important book. I love how Achebe proudly recreates the history and social structure of Igbo culture before the colonial/missionary onslaught began. I actually appreciated his inclusion of less favourable subject matter such as misogyny as it offers a truer reflection of reality. Lets face it, set in the 1890’s, misogyny was rife in every culture, including British. The point I take from it is that their culture wasn’t given the opportunity to evolve naturally overtime, as all cultures do, and slowly do away with more contentious issues and traditions, instead it was ripped from them. Achebe doesn’t idealise the traditions of his Igbo forefathers and in doing so highlights all the good that they also lost in the process of being ‘civilised’ by foreign invading powers.